Having a hearty breakfast can help keep your energy levels high all day. While vegan eating may sometimes present challenges in finding good recipes, there are plenty of healthy breakfast foods you can enjoy when you don't consume animal products. 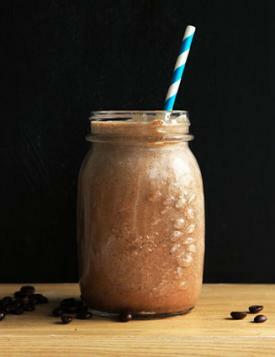 Smoothies make a great breakfast on the go, and when you make them with coconut milk and chia seeds, they're high in protein, satisfying, and flavorful. The chia seeds expand when you soak them in the coconut milk, making a slow-digesting gel that keeps you satisfied for several hours. The recipe serves two, and will keep well in the refrigerator overnight. In a small bowl or glass measuring cup, combine the coconut milk and chia seeds, stirring to combine. Allow the chia seeds to soak in the coconut milk for 30 minutes. Add the chia mixture to the blender with the remaining ingredients. Blend on high until smooth. Quick breads make a tasty breakfast, particularly when you combine them with fresh fruit or as a side to a tofu scramble. Toast them in the toaster or oven and spread them with your favorite spread, or have them with a vegan yogurt parfait (see recipe below). Try this vegan eggless banana bread recipe, which is perfect for a meal on the go, with a sweet, dense, intensely flavored quick bread. While donuts probably aren't a great everyday breakfast because of their sugar content, occasionally nothing else will satisfy you quite like a donut will. These vegan donuts will help satisfy your morning pastry cravings. As an added bonus, they are baked, so they have less fat content than a traditional donut. If you're looking for a savory breakfast food, then vegan bacon is a great idea. Made from marinated tempeh, this vegan bacon is delicious alongside the banana bread or tasty with eggless pancakes. If you feel like you don't have time to prepare breakfast because your mornings are so busy, consider making it the night before and cooking it slowly overnight in your slow cooker. 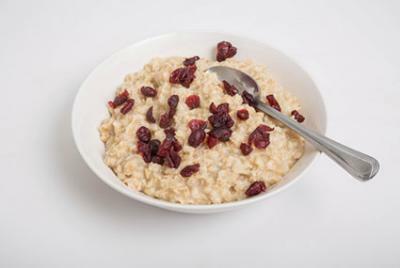 This oatmeal is fragrant and delicious, and it's loaded with dried fruits, spice, and nuts. The recipe makes four servings. In a slow cooker, combine all ingredients except the maple syrup. Stir in the maple syrup just before serving. 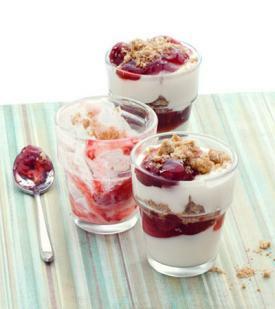 These breakfast parfaits are easy to put together, and they make a tasty breakfast. The recipe yields two parfaits. In a small bowl, whisk together the yogurt and maple syrup. In glasses or parfait cups, layer the yogurt mixture with the pecans, strawberries, and bananas, making two layers with each ingredient. Breakfast doesn't need to be complicated. This simple breakfast will keep you satisfied for hours, and it contains healthy omega-3 fatty acids. It also comes together in about two minutes. The recipe serves two. 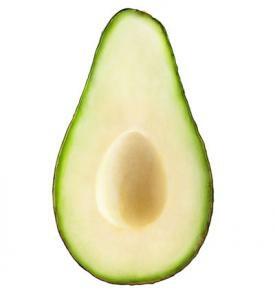 Using a large spoon, scoop the avocado halves out of the peel. Put each half in a small bowl with the cut-side up. Sprinkle the avocado halves with the salt and cayenne. Sprinkle with the raw pumpkin seeds. Looking for a fancy recipe you can serve to guests? Try this vegan quiche. It's made with asparagus and mushrooms, and is high in protein. Another terrific brunch or breakfast for company recipe, this eggless 'eggs benedict' features flavorful tofu with a creamy sauce atop a toasted English muffin and vegan bacon. It's a high-protein, delicious way to start your day. Traditional crepes contain eggs and milk, but these vegan crepes are just as flavorful and versatile as their non-vegetarian compatriots. This recipe has a sweet fruit filling, but you can substitute a savory filling, such as a tofu scramble, vegan bacon, or other fillings. The recipe serves four. In a blender, combine the almond milk, 1/4 cup of the margarine, the maple syrup, and the flour. Blend on high until smooth. Refrigerate for two hours. Spray an 8-inch nonstick pan with cooking spray and warm it on medium-high heat. Working one crepe at a time, pour 3 tablespoons of the batter into the hot pan, tilting the pan to spread it evenly across the bottom. Cook until lightly browned, about two minutes. Flip the crepe and cook on the other side. Keep the crepes warm in the preheated oven with a piece of parchment between each to keep them from sticking to each other. While the crepes stay warm in the oven, melt the remaining two tablespoons of margarine in a nonstick 12-inch pan on medium-high heat. Add the peaches and cook, stirring occasionally, until they are soft and begin to brown, about five minutes. Add the brown sugar, cinnamon, salt, and bourbon. Cook, stirring occasionally, until a light syrup forms, four to five minutes more. 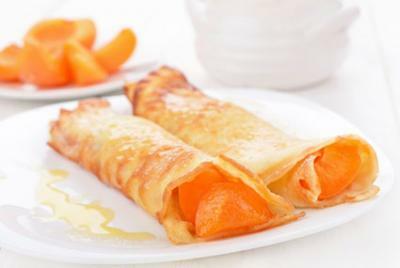 Fold the crepes around the peaches to serve. Whether it is something as simple as sprinkling avocado halves with pumpkin seeds or something much more complicated like peach crepes, eating a healthy breakfast can get your day off to the right start, allowing you to stay energized as you go about your day. Use these recipes to help ensure you don't skip this important meal.